JCB telescopic loaders took part in the first stage "Formulas-1"
Fifteen of telescopic loaders JCB Loadall 531-70 collected at the main factory in Staffordshire, was on duty near the track at the Grand Prix of Australia in Melbourne. The tasks of the machines includes the rapid evacuation of the damaged racing cars in all stages of the competition: during practice sessions, qualifying sessions and Sunday's race. Specifically this was developed for the crane beam, whereby evacuees racing car is at some distance from the machine. This makes the transportation process easier and safer. In February, JCB has announced a partnership with the Racing team SportPesa Point F1. 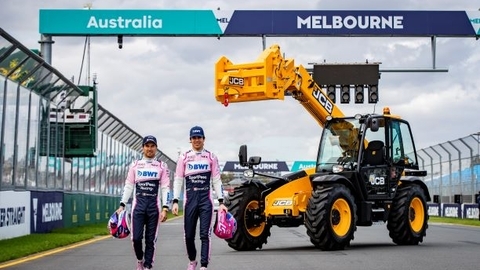 Under the terms of the cooperation the image of the insignia of the company was presented at two race cars under the direction of lance Stroll and Sergio Perez. "We are excited to begin working with the team SportPesa Point Racing and are honoured to use our equipment at the Grand Prix of Australia. JCB Loadall — the most popular telehandlers in the world — have become accustomed to racing tracks "Formula 1". Their duty at the tracks first race of the season — the opportunity to demonstrate the ability of these machines," said Michael Plummer, Director of marketing for JCB Global.